Announcing the March 19 Release of "White Swan"
Tickets can be purchased either at the store, through the online store or by phone with your credit card at (310) 828-4497. "White Swan," Susie Glaze's fifth release, is truly her most eclectic and collaborative album in over ten years of her critically-acclaimed career as a bluegrass/folk recording artist. With this CD her Hilonesome Band has veered into the realms of new Celtic-inspired folk songs that harken back to the ballad form from the pen of lead guitarist Rob Carlson, as well as re-interpreted classic cover songs from such diverse sources as James Taylor, Steve Earle and Jean Ritchie. Also featured are two songs from Los Angeles singer-songwriter and Kerrville New Folk Winner Ernest Troost. Arrangements and new interpretations of songs you think you knew are here for re-discovery from this gifted acoustic quintet in a lush and orchestral folk setting. Susie states about this album: "The fine players of the Hilonesome Band and I have created these tracks together and on this album you hear their voices alongside my own. We've come a long way from the early years of our band's inception. We reached for the sounds of bluegrass because it was the music we loved ~ we were drawn to the stories, the romance, the warnings, the humor and the tragedies. Now we have found our sound branching out with a natural evolution ~ it came with exploring the older stories and longing for more complex music. Rob has been inspired to capture the darkness and mysteriously tragic elements of balladry from Ireland, England and Scotland. With the integration of real historical elements along with new and deeper complexity in music, our sound has made a most interestingly subtle shift: we've cast a wider net to discover a sound unlike anything we've done before. What is here is a true melting pot of influences that move us, from bluegrass to country to Celtic to Appalachia, and we've found our true home in this, our new, unique sound." The eclectic range takes the listener from bluegrass ("Little Rabbit") to pensive country ("Evangeline") to Bossa Nova ("April Fools") to Celtic-inspired torch song ("Dark Eileen"). The album begins with a newly-interpreted "Mill Worker," James Taylor's classic, introduced by Mark Indictor's beautiful fiddle on the traditional "Si Bheag, Si Mhor." Indictor's fiddle is featured again on Carlson's new take on the old "Polly Vonn" story, this time as the title track "White Swan." Jean Ritchie's little-known but powerful "The Soldier" sends a message about the costs of war on the soul. The innovation of this formerly-bluegrass band is taking them to a distinctly folk-driven Americana music, the sounds that came to America with the first immigrants: Appalachia, old-English balladry, Irish barn-burner fiddle music (the outro of "White Swan" was penned in the studio) and tender stories of family and legacy ("Harlan County Boys"). One great album bonus is the inclusion of a previously-recorded live onstage sound track of the classic Childe ballad, "Fair Ellender," arranged by Jean Ritchie, with Susie accompanied by Ritchie sons Peter and Jon Pickow and famed East coast fiddler, Kenny Kosek. At this concert, the Hilonesome Band will re-interpret "Fair Ellender" in their own way with bouzouki, guitar, fiddle and bowed bass. Commemorative posters of the album art by project art director Anita Atencio and signed by the band will also be available. "They’re a band who could be the next bright stars of the roots music / folk-Americana world. This new album could be the launch vehicle that does that for them. Susie Glaze & the Hilonesome Band had plenty of momentum coming into the new album, 'White Swan.' They’ve played the theater at the Hollywood Bowl. The Guide’s editor, writing the annual “Best of / Top Ten” for FolkWorks back in 2008, named them among the best acoustic bands in Southern California. And that’s far from the only coverage they’ve gotten, being one of the most-written-about bands in the Acoustic Americana Music Guide. They won the "Just Plain Folks 2006 Music Award" for "Best Roots Album," and were named by the Guide's editor as FolkWorks Magazine’s Pick for "Best Bluegrass Album of 2005" for the band’s debut album, "Blue Eyed Darlin'." Each of their subsequent albums has received critical acclaim as their audience grows numerically and geographically. Their most recent previous recording, "Live at the Freight & Salvage," was released in 2011 and featured guest banjo virtuoso Bill Evans. This time, on 'White Swan,' it’s abundantly clear that the band’s regular line-up is quite formidable on its own, and this new CD is a gem. 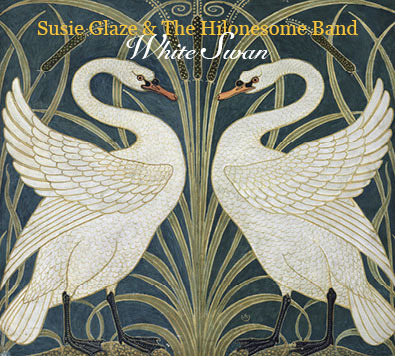 Susie Glaze and Hilonesome are now a group of veteran and accomplished acoustic musicians, and on “White Swan,” they have crafted instrumentations and arrangements that exceed all expectations for an indie project. Indeed, it’s doubtful that a major label would have opted to defy the current self-imposed constraints of formulaic bluegrass and allowed a recording like this to happen from an ostensibly bluegrass outfit. And that raises two points. One, it’s time to stop seeing their genre, and even their emphasis, as singularly bluegrass. And, two, as Susie Glaze says in the liner notes, “This is the most truly collaborative work I’ve ever released.” Her statement speaks volumes. The point here – playing bluegrass with no banjo – could serve as a starting place to critique the difference between East Coast and West Coast bluegrass. Since Nashville took-over everything they believed could be homogenized into their version of “country,” even Eastern bluegrass fell prey to having the clamps screwed-down tight on anything “different” or innovative. Too often, Eastern bluegrass has been characterized by the repetitive sameness of each player taking a solo of the same duration, in the same sequence, in every tune they play. Even those blazing-fast, nimble-fingered runs fail to dazzle when you’re seeing and hearing it all for the fifth time in five songs. In the case of this band, with its very Appalachian-sounding name – Susie Glaze and Hilonesome – the musical repertoire has always spanned a spectrum from traditional bluegrass to nu-grass, from pre-bluegrass tunes of the mountain hollers to contemporary alt-country and traditional folk-Americana. They’ve always done all of that remarkably well, often superbly – including nimble-fingered playing – even through personnel departures that changed the emphasis of instrumentation. Thus, the new album is different. Does that mean bluegrass fans will sigh, shake their heads, and shuffle dejectedly to the exits? Hardly. The band has been sans-banjo long enough that they’ve built a solid identity as a guitar / mandolin / upright-bass ensemble that fluidly exchanges leads with Susie Glaze’s perfect-pitch vocals and guitar and sometimes her mountain (fretted) dulcimer. We’ve complimented Susie for years for getting everything she can from her talented band, doing what musicians call “being generous” on stage, giving each player their own credited lead roles on “their” songs, while everyone else, including Susie, becomes that member’s back-up band for that song or tune. Few band leaders do it so well, and keep everyone happy so easily. In concert and on the new CD, audiences enjoy the variety as the spotlight moves from player to player, song by song. And that way of doing business has perfectly translated to “While Swan,” their “most truly collaborative” new album. All of it seems to come naturally for Susie Glaze, given her start in show biz, singing in the Broadway cast of “Big River.” The result of that kind of formative experience? This band is a musical collaborative that fires on all cylinders and runs smoothly with lots of horsepower. It’s evident from any angle, and in every track of the new CD. Susie takes lead vocals on nine of the eleven tracks, playing guitar on three and mountain dulcimer on one. Steve Rankin and Fred Sanders each get one lead vocal. Backing vocals are minimalist presences, always just right, harmonizing without becoming choir-like. Rankin plays mandolin, bouzouki, and acoustic guitar. Sanders is a wonderful presence on bass. Rob Carlson plays acoustic lead guitar and resonator guitar. Mark Indictor’s fiddle-playing is mesmerizing. Guest musicians on the record appear on only one track, “Fair Ellender,” contributing nicely-woven hammer and mountain (fretted) dulcimers played by Peter and Jon Pickow, respectively, and there’s fine fiddle by Kenny Kosek. Everything on the album creates a tapestry of sound, with all the threads creating bright and intricate images that are seamlessly woven together."